The landslide in Oso, Wash., from a collapsed hill above the Stillaguamish River was a startlingly large-scale event with debris that covered more than one square mile—destroying a neighborhood, killing 43 people and damming the river, which caused upstream flooding. The event was so alarming that it prompted a major rethinking of how people map, monitor and manage such hazards. In response, Washington State now is working to inventory landslide-prone areas with LiDAR technology, which you can read about in our cover story on page 20. This ambitious statewide use of LiDAR is a natural progression for the technology, as the realism of such data dramatically improves human understanding. Inventorying landslide areas is an excellent use of LiDAR, as is the coastal work that has been ongoing by NOAA with its Digital Coast initiative. As the benefits of analyzing such data compound, there’s growing momentum for collection across the country via the 3D Elevation Plan (3DEP) initiated by the U.S. Geological Survey that now awaits funding. The countrywide collect planned in 3DEP is an extremely important effort, which should be fueled by the technology’s maturity and proven value—not to mention averting regret by being proactive rather than reactive. However, a one-time commitment isn’t enough, as the first effort simply captures a baseline measurement. It will be difficult to make much immediate use of the massive amount of data that would be collected in the 3DEP program. Yes, the data would be of great value, but only repeat collection and automated correlation would generate instant hazard detection. We need to interpret and understand what’s contained in the data. There simply aren’t enough eyeballs for analysis, but if the advancing technology of change-detection algorithms are applied, then computers automatically make quick work of this task. Correlating a series of yearly or bi-yearly collects for high-hazard areas with automated workflows to highlight change would allow for easy monitoring and ample advance warning. Another place where detailed 3D data for the country would come in handy is to inform the design and engineering of our built environment. The process of importing such data to produce models for civil engineering purposes is the realm of our sister publication, Informed Infrastructure. 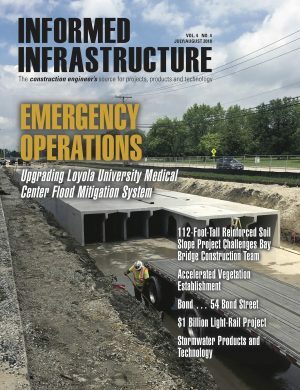 In that magazine, a 3D starting point is a critical input for site design, earthworks, and roadway design that optimizes cut-and-fill for lowest-cost and highest-performing design and construction. There’s a fascinating transformation that’s taking place in the civil engineering world: from plan design to model-based design. The latest tools ensure the model becomes what’s built through virtual design and construction. There’s also automation that will benefit from 3D, as machine control of dozers and graders are shaping the land according to the model—taking from or adding to what’s there to achieve the desired topography as dictated. This evolution will have a two-way benefit for those who manage such things as landslide hazards. With more-detailed modeling, and models that can convey the physics of forces at play, managers will be able to simulate and predict change more accurately. With data and models, we can share the understanding of risk and save lives, property and the infrastructure that connects us. Matt Ball is founder and editorial director at V1 Media; e-mail: mball@v1-media.com.